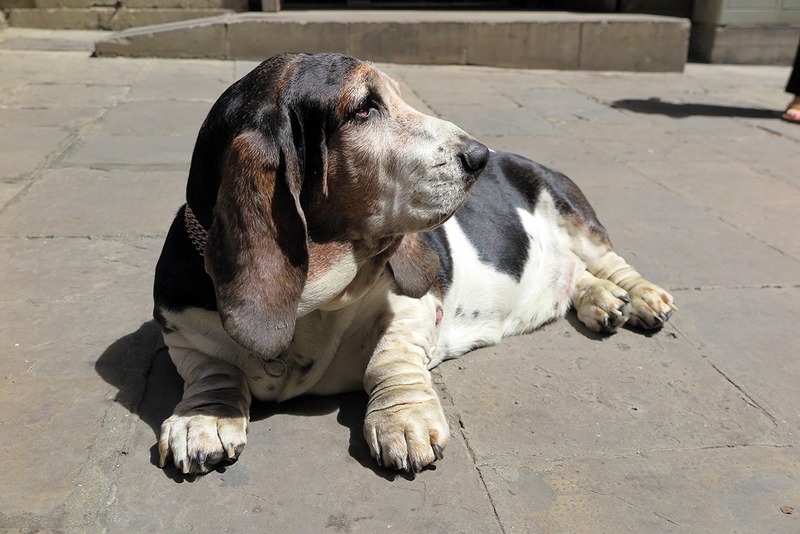 When you roam the tiny charming streets of Barcelona’s Gothic Quarter, or Barri Gòtic as Catalans call it, it makes you feel like you stepped hundreds of years into the past. That is, if you manage to visually remove all the vendors and tourists. However, the reality can be very different than what it appears to be. It turns out that Barcelona has rebuilt a lot of buildings that had been destroyed and managed to cover up the past. A sharp eye will, however, notice! Back in history, Barcelona wasn’t originally so ornate and full of monuments. It wasn’t even a capital of the province until as late as the Middle Ages. Barcelona won its popularity thanks to the walls circling the city with many defensive towers around it, which had been reinforced in the 4th century AD. For this reason Barcelona became the seat for any invaders, as it provided them safety, and that’s why Tarragona lost its appeal. Let’s have a look at what remains from the old times and what’s just pretending to be the original! Except from Barcelona, there are many other amazing cities to visit in Spain – see them here. 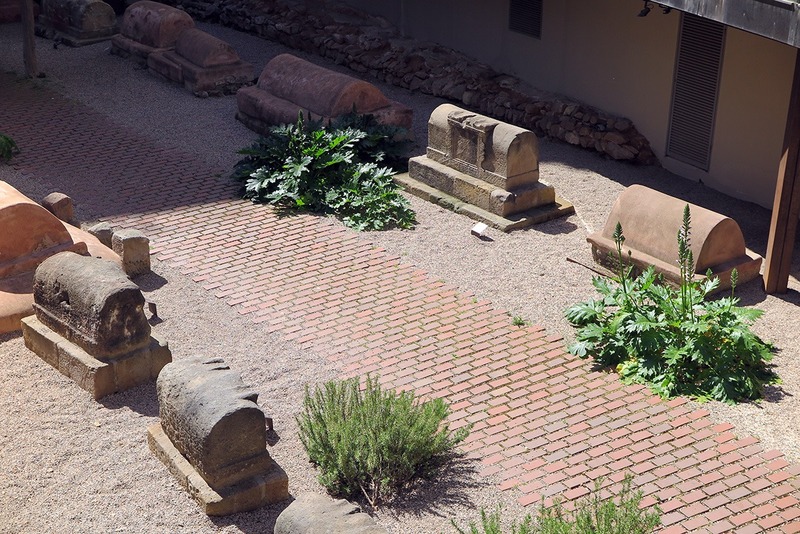 During the Roman times, people believed that a person dies twice – once when the body dies and second when he/she is forgotten. That is why they placed tombs along one of the main routes leading from outside the walled city to the inside (most inhabitants lived outside). That way, one is not forgotten and each time people pass by and read the name on the tombstone, he/she is remembered. These tombs that you see today are the originals and not fakes. The aqueduct on Plaça Nova Square was placed here after the Spanish civil war of 1938-39. It’s not fully made up, such aqueduct had indeed been located on the Square, just the building blocks were much bigger. This way, the fascist era is kind of forgotten and covered up. Well done. It wasn’t a good era. Notice how there are no holes in the gargoyles for water to run through them – that is because they’re fake! Also, their placement is rather random. There’s no use in placing gargoyles on a bridge that’s already covered with a rooftop. They serve more as reminders of medieval times, but are not functional elements. Historians call them grotesques. The deceitful bridge in Calle del Bisbe.. so many false elements on it! El Templo de Augusto was built in the late first century BC. 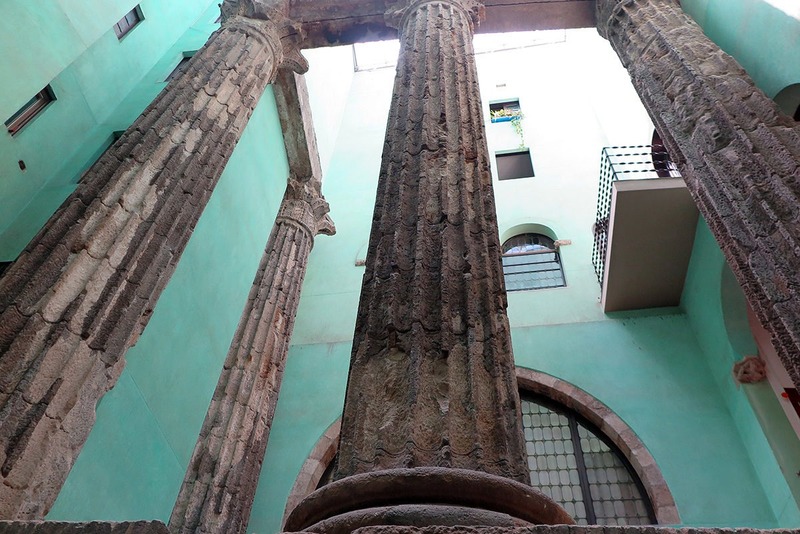 The columns that have stayed till this day are now covered with walls of a courtyard that protects it. Actually, people live in buildings whose windows lead to the columns and therefore have to bear tourist noise all day long! This is what’s left from a Roman temple.. 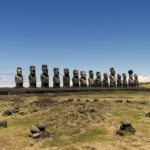 These pillars are more than two thousand years old! 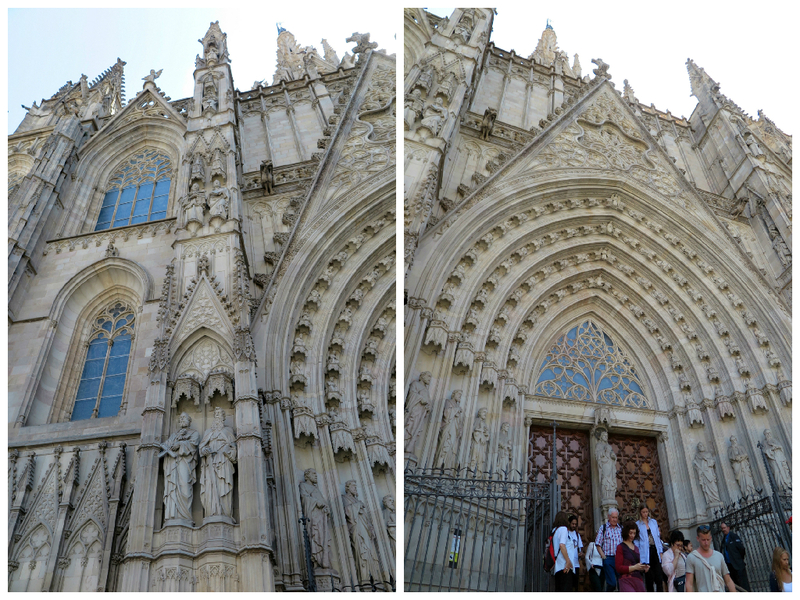 Barcelona Cathedral itself was kept in its original state, as it was constructed between the 13-15th centuries. It never burned down, so big numbers of gothic paintings stayed well preserved. The controversy with this Cathedral is about its façade, which it received in 19-20th century and Neogothic style was chosen for it. Antoni Gaudí, the famous architect and creator of remarkable buildings such as the Sagrada Familia and Casa Batlló (LINK), hated the front façade to such extent that he would never enter the church from the front. The area that today is Vía Laietana, was full of old Roman houses. Some were in a bad shape but some still quite well preserved when the city decided to demolish them and create a boulevard to make space – that project was finished in 1926. Some houses were even moved stone by stone to various locations, like e.g. to our next point of interest. On the square Plaça de Sant Felip Neri, which is often used in films as old Paris, you can notice holes on one of the buildings. 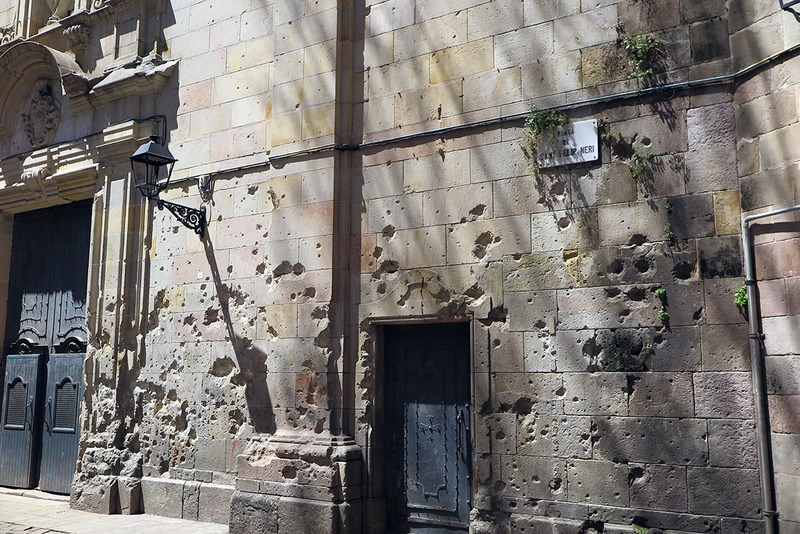 Those holes are fragments of fascist bombs from the Spanish Civil war. But the fascists claimed they were bullet holes from executors. There’s also an old-looking fountain in the middle, but it’s only around 50 years old. 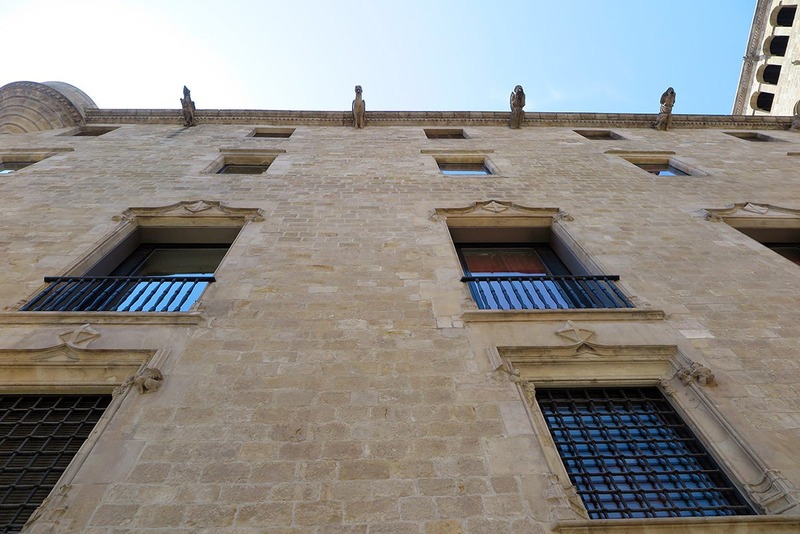 The bullet holes caused by fascists..
A big complex of buildings called Reial Major de Barcelona was modified over the years – some of its windows are in the renaissance style and the later added gargoyles are in the gothic style. Barcelona’s Museum of History on Plaça del Rei was originally located somewhere else – at the Vía Laietana area! The house belonged to a nobleman and it also got fully dismantled and moved to its today’s location at the Plaça del Rei. While relocating the palace, some elements were modified or added to it – a neogothic portal, an arcade and there’s something about the windows as well. Why all the changes and modifications, you ask? A big part of the decisions in the early 20th century was because of the mayor of that time – Ramon Rucabado. 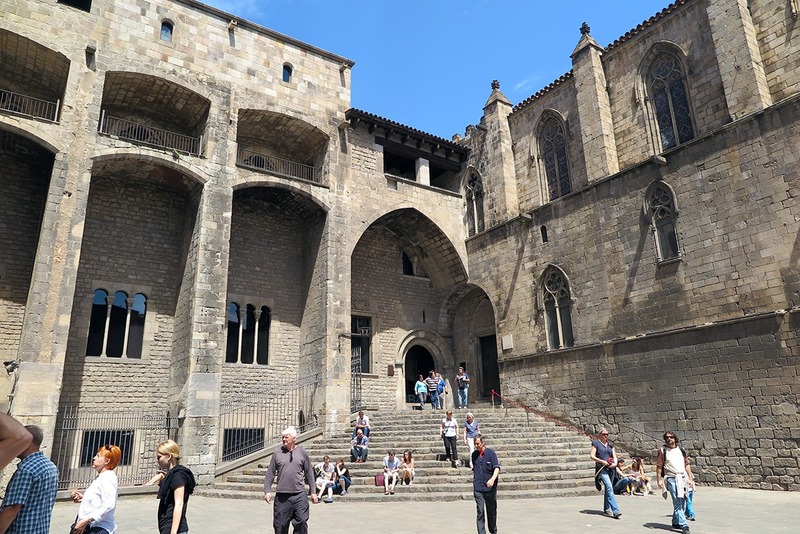 He wanted to do a facelift of the Barri Gòtic, remove some newer buildings that looked ‘vulgar’ to him, and build some old-looking pieces that would look like from Roman/Medieval times. Barcelona also wanted to be ready for the World Expo in 1929, which took place there. From that time, also the bridge between the two casas in Calle del Bisbe comes from. The Casa Padellás, or today’s Museum of History, was another representative of that case. All in all, Barcelona really does have its Roman and Medieval origins and many things have stayed beautifully preserved until this day. However, some local Catalan mayors and noblemen thought they could shape the history and often failed in masking their marks. But isn’t this what’s even more unique about it? I totally think so! 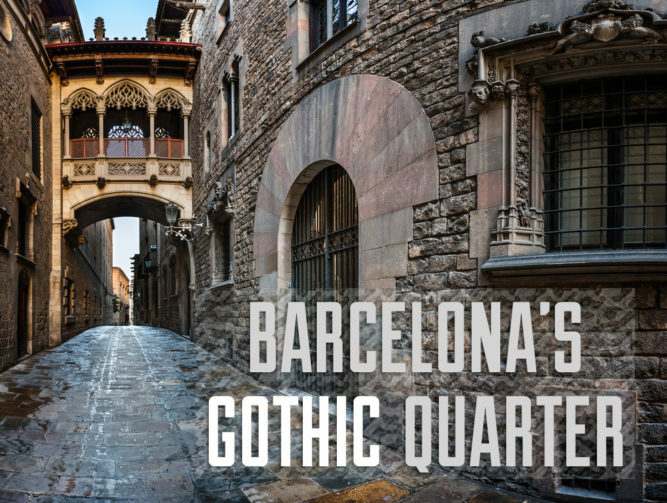 Some might call Barcelona’s Gothic Quarter a theme park, but it still teaches us a lot about history. 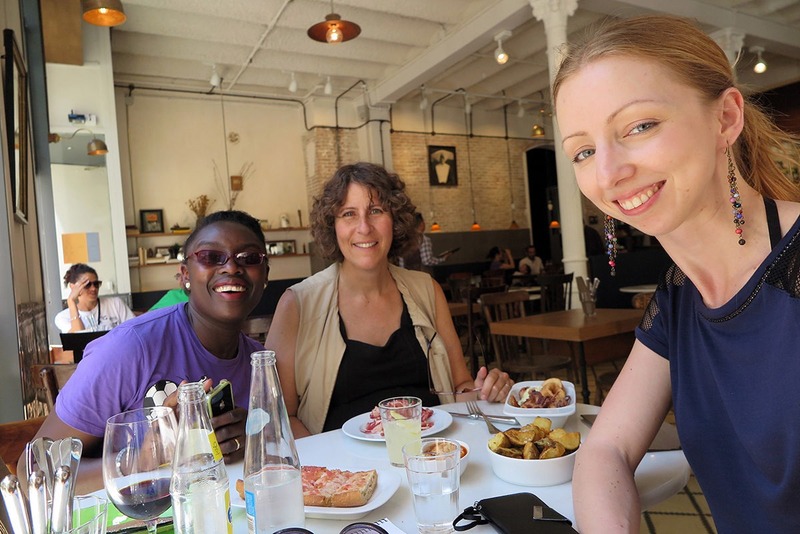 I was exploring Barcelona with Context Travel and their incredibly knowledgeable (and fun!) guide Biel. He told us so much more than what I was able to note down. 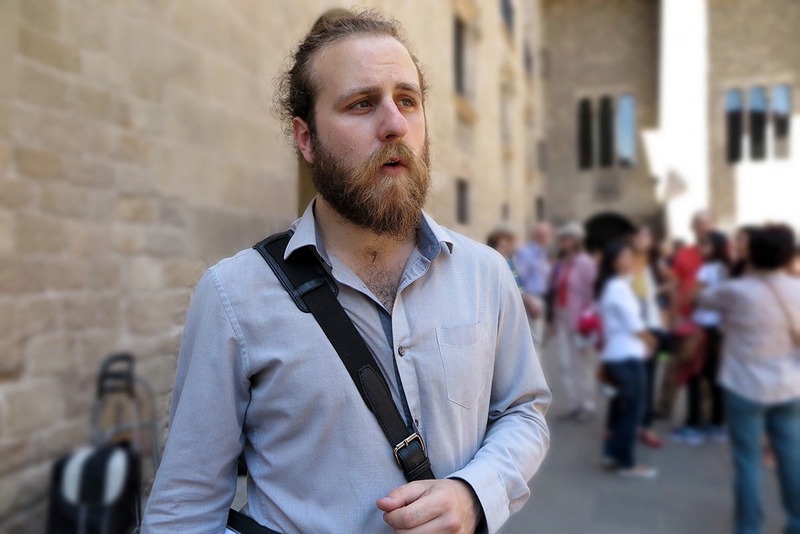 Actually, he told us the whole history of Barcelona and Spain and even a total history dummy like me found it incredibly interesting. Oh and don’t worry, I didn’t tell you everything! 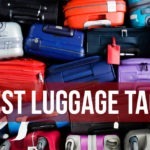 If you go on a tour with Context Travel, you’ll still hear a lot more. Facts about the Spanish inquisition and what stayed behind are incredibly interesting, as that’s a part of Spain’s dark history. We had a lot of fun together with fellow bloggers Victoria of britishberliner.com and Rachel of rachelheller.org. In Barcelona, it was just the Mother’s day, or how they poetically call it: El día de Madre. We got to see a procession in the street carrying Virgin Mary. It was quite entertaining, even though it was a bit painful to the ears – their drums were loud! 3 happy bloggers having awesome tapas! Of course, visiting the Gothic Quarter is not enough at all, so here’s a resource on other things to do in Barcelona. And there’s more! 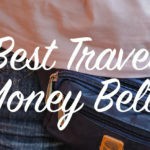 Check out this post on awesome day trips from Barcelona. 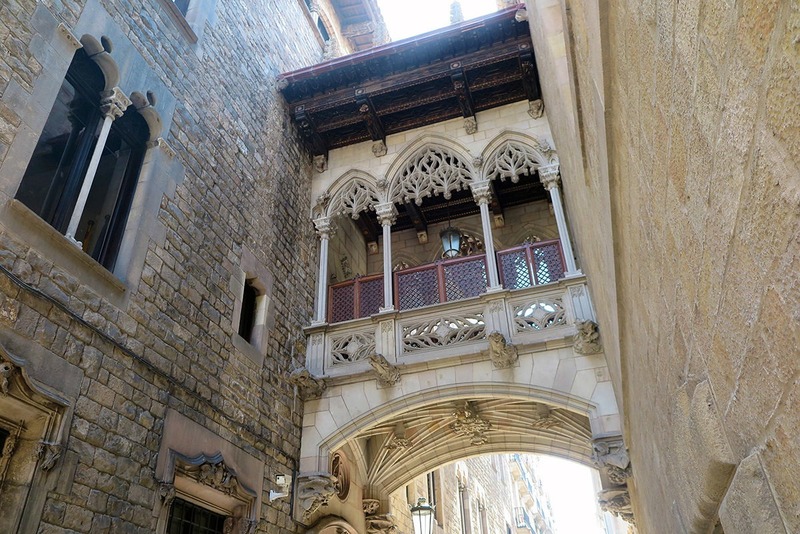 Did you hear for the first time that Barcelona’s Gothic Quarter is not so genuine? Pass the information on and share this post! For you, fellow pinners, here’s a pin! I was visiting Barcelona last year and my hostel was in the Barri Gotic. I really liked this part of town, it’s full of atmosphere. Oh really, it must be quite unique to stay right in the Barri Gothic! Loved reading this article! I actually study Latin at uni so I’m always especially interested by the Roman sites! Those tombs look so well preserved!